Place the caramel in a bowl, if it's too hard heat in a microwave for 20 seconds or using a blender until it's creamy. Add the evaporated milk little by little and beat until it’s all well incorporated, add salt and stir well. Pour into the molds and freeze over night or at least 3 hours. If removing the pops from the mold is too difficult, just wet the outside with hot water from the faucet. If you don't have pop molds you can use paper cups and after 30 minutes bury the popsicle stick into the center. When vacations and warm weather arrive, children tend to want to help out in the kitchen and learn a few simple recipes. You can make this simple recipe with your children in just a few minutes. 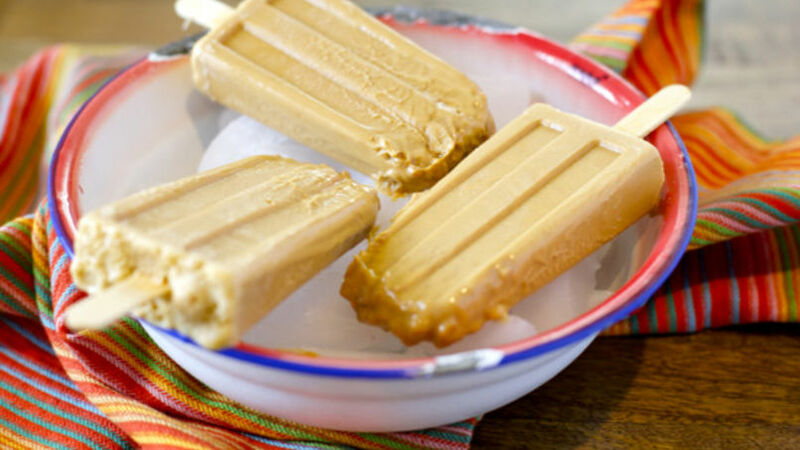 Use your children's favorite caramel because that will be the flavor of the paletas.